I have created a script in 2015 to download all documents from a site collection to a file share or local drive (blogpost) but we now received the request to download and synchronize documents from SharePoint Online. The customer wants to download all documents from one library and keep the documents updated on the file share. SharePoint Online will be the source location where users will be working daily and the file share will be the destination with files max 1 day old. The customer also wanted to use a list field to categorize the documents and place them in folders on the file share. This would make it easier to find the files. 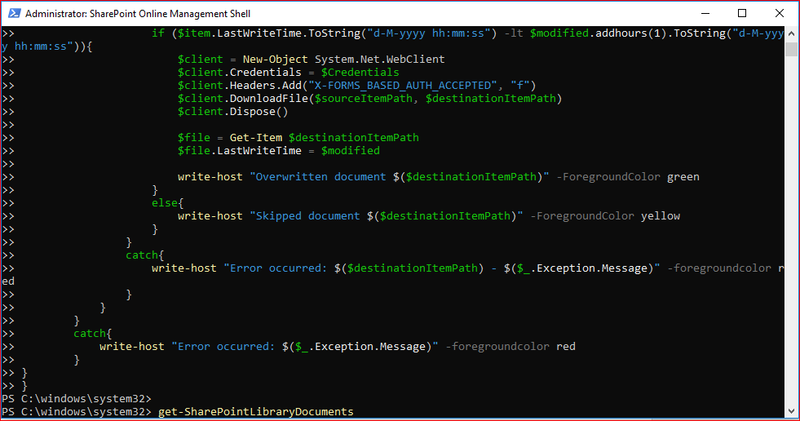 I’ve created this script with CSOM using PowerShell for SharePoint Online but it can be also used for SharePoint 2013/2016 and also 2019 with a few modifications. You can find the full script below where I will break down the script in a few sections to explain it in detail. I’ve hard coded the source and destination in this script as it was only required for one list but you can use a .CSV file if you have multiple sources and destinations. Note that you should keep the last slash or backslash in the string for $sourceSite and $destinationPath. 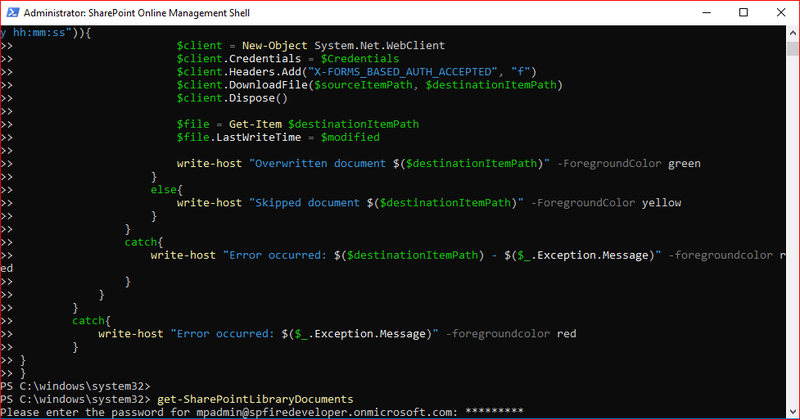 I’m running the script in the SharePoint Online Management Shell but you may need to add the SharePoint client DLL’s if you want to use this script on-premises. The credentials are again hard coded for this blog but we created a secure text file with the username and password on the server which it will use for its daily schedule. The below can be used to test the script. We are going to use some item properties which we will store in variables directly after the for each. We will also build our source and destinations strings to be used in the next bits. We have a column “Meta” in our test environment which we use to categorize our items and we will need a folder for each unique “Meta”. The below section will create a folder if it doesn’t exist. 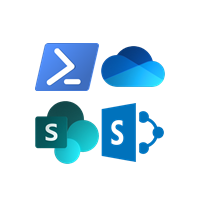 The below bit of code will first verify if the item does not exist and will then download the file using system.net.webclient which works for SharePoint on premises and SharePoint Online. We will update the last write time and creation time of the item to the same dates known in SharePoint. Otherwise it will have the dates of the download. You can also use the last saved date of the item but it is harder to retrieve this property and this property may have a mismatch with the modified date of SharePoint. In the next try catch we will verify if the item present is not the same item as currently in SharePoint because we will otherwise use server resources which are unnecessary as we only want to download new items or update current items. Note that I had to add “.addhours(1)” to my modified variable as in my case the time zone wasn’t matching for SharePoint and the file share. This may also be correct or off by 2 hours, but you will notice this when files are being overwritten and not skipped.